What is the Acrylic rhinestone? - Hwatien Enterprise CO.,LTD. acrylic diamond is a commonly known (also known as crystal diamond Rhine Shiying Wen name: crystal, plastic gems) whose main become a crystal glass, is one kind of jewelry accessories man-made acrylic gems cut into diamond facets obtained, because this material more economical, while the eye-catching diamond-like feeling of the visual effect there. So popular was welcomed, stones are generally used for mid-range of jewelry design. Due to the current global man-made Acrylic rhinestone manufacture, located in the Rhine north and south sides, so called acrylic diamond. Produced in the North Shore's most did Austria Swarovski diamond, referred to as the Austrian drilling. It attracts very sunny, good gloss, called the south bank of the Czech drilling. Absorb sunlight is not very adequate luster better than the Austrian drill. Most of our products are Austrian drilling small part of the Czech drilling. Now some manufacturers to adopt domestic piracy kg drill, made of glass in kg bargaining. acrylic diamond classification: By color can be divided into: white diamond, color diamond (such as pink, red, blue, etc. ), diamond (also in AB drilling), color AB drill (such as red AB, blue AB, etc. 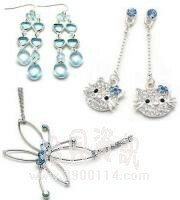 ).According to the shape classification can be divided into: ordinary drill, shaped Acrylic rhinestone, diamond shaped plastic gems can be divided into the drill (horse eye stone), ladder drills, satellite stone, no end of drilling.Acrylic rhinestone facets: general diamond eight section, the back is a layer of diamond plating on mercury skin. By section of the condenser, it has good brightness, multi-slice, the better brightness, Swarovski is the first to discover the acrylic diamond section of people.Austrian Swarovski Crystal: the cutting surface can be up to thirty of its multi-faceted, so a high refractive index, reflecting the height of a deep sense, because of its hardness, gloss retention so persistent, is the leader in plastic gems. "Swarovski" stones produced in 1895 in Austria, with its unique crystal crushed stone inlay work known. 18th century, Daniel "Swarovski invented the automatic crystal cutting machine market. Since then, the crystal morphology can be ever-changing, so that hidden poetic charm dripping play. Swarovski is not only synonymous with man-made crystal products, but also a cultural . symbol it has an irreplaceable value, that is - fun Swarovski currently the world there are many plants, so Swarovski only represents a quality, not necessarily produced in Austria. Czech stones: plastic gems cutting surface is generally more than a dozen of its surface, so better refraction can be a reflection of a very bright light, strong hardness, gloss retention in about three years, after the Austrian drilling. Middle East and domestic diamond stones, etc: these are some of the diamond manufacturers to meet the market, low-cost manufacturing diamond, the quality is lower than the Czech diamond. Usually stones arranged in accordance with the quality and price are: Austria drill (that is, SWAROVSKI), Czech drilling, drilling Korea, the domestic A drill, domestic B drill. However, drilling Korea also graded, the real import of Korea acrylic diamond brighter than the so-called "Czech drilling," because it has been polished side, it looks very bright, light transmission very good.